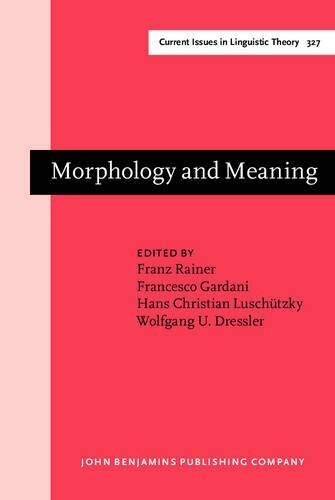 [PDF] Morphology and Meaning: Selected papers from the 15th International Morphology Meeting, Vienna, February 2012 (Current Issues in Linguistic Theory) | Free eBooks Download - EBOOKEE! Description: The problem of form and meaning in morphology has produced an impressive amount of scholarly work over the last hundred years. Nevertheless, many issues continue to be in need of clarification. The present volume assembles 18 selected papers from the 15th International Morphology Meeting (Vienna, 9â€“12 February 2012) relating to this vast field of research. The introduction provides a detailed overview of the state of the art in the field. It is followed by three articles derived from the plenaries that are dedicated to fundamental issues such as the relationship between morphological meaning and concepts, between word formation and meaning change, as well as indirect coding. The section papers tackle a wide array of issues, including affixal polysemy, pathways of grammaticalization, the processing of compounds, mismatches between form and meaning, synonymy avoidance, or the semantics of specific patterns of noun incorporation, compounding, reduplication and mimetic verbs. 2009-03-05Dictionary Visions, Research and Practice: Selected Papers from the 12th International Symposium on Lexicography. No comments for "[PDF] Morphology and Meaning: Selected papers from the 15th International Morphology Meeting, Vienna, February 2012 (Current Issues in Linguistic Theory)".